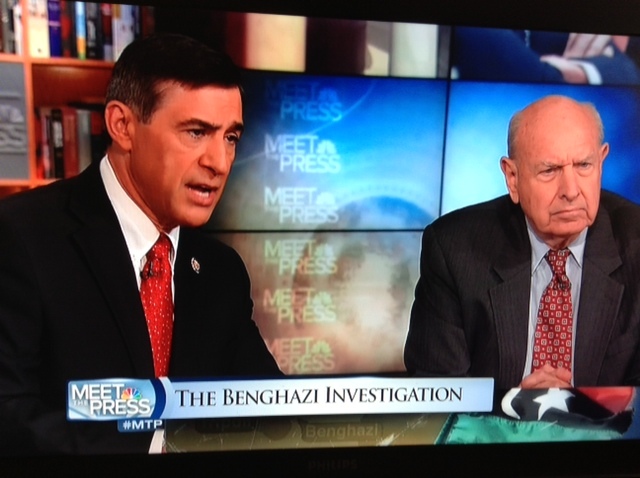 Today’s Meet the Press opened with Congressman Darrell Issa (R-CA) chair of the House committee re-investigating the September 11, 2012 attacks on the US mission in Benghazi, Libya. At that point, the camera had to pull back to reveal that Ambassador Pickering had been sitting there the whole time. It was a weird moment, but it led to a real conversation. Ambassador Pickering then calmly walked through the findings of his report, answering all of the most serious questions Congressman Issa says he is investigating. The tension in the studio was apparent, even through the TV screen. David Brooks of the New York Times had an interesting take on all of this. He reminded us that the attacked facility in Benghazi was actually run by the CIA. Brooks says the fight revealed in the relevant emails after the attack tells him that the CIA was trying to push blame from themselves onto the State Department. And the State Department pushed back. Hardly the Watergate level scandal alleged by some.